After a few workshops at Okno to develop the observation system, I start to monitor the development of a colony from its swarming dd. april 26 2011. The bees start building a new nest in the green beehive that is set up for the monitoring. The hive is located in the okno garden, about 3 metres from the window of the studio. 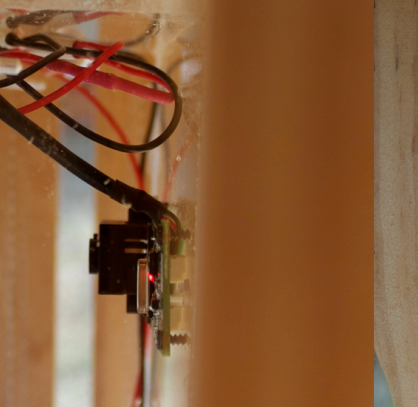 Two webcams are installed in the middle frame of the brood box , in a small plexi box. If the web cams would not be protected, the bees would cover them with propolis. The camera’s send a steady stream of images, 1 per minute, via a PC board installed in one of the honey supers of the hive. The PC is connected to the internet via an ethernet cable. The purpose is to follow at any time the comb building and the growth of the colony. The images are continuously displayed on a large flat screen and can as well be consulted in real time via the internet. The inside of the beehive is lit with an infrared led lamp for filming. The bees are not disturbed by this red light. Their vision spectrum ranges from ultra violet (what a human eye cannot perceive) and it stops before red range – bees cannot see red. We see the beginning of comb building after swarming. 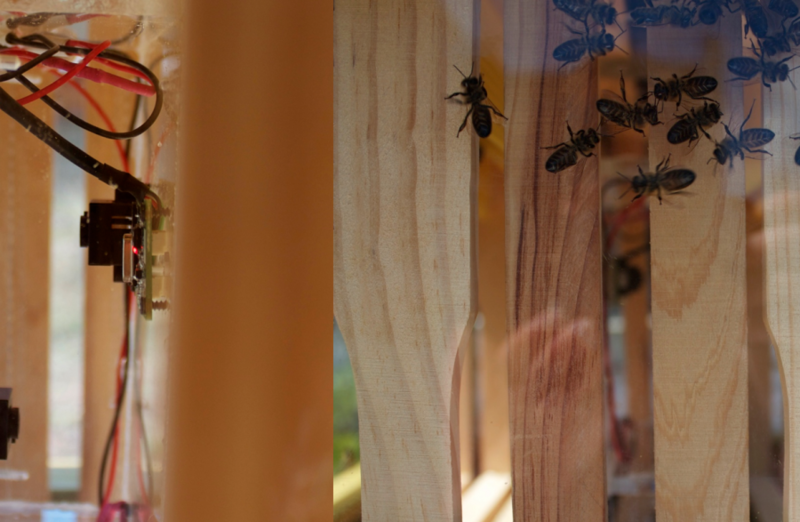 The bees start building from the left corner of the first frame. They construct several parallel layers of honeycomb. Over time they will expand the comb so that it covers the complete inside width of the hive. The swarm organises itself to build a new home for the colony. This entry was posted in bee monitoring technology and tagged bee monitoring, ict, okno on 01/05/2011 by admin.